Shares in troubled Deutsche Bank have fallen even further to a new low. They fell another 3% to €10.22 during morning trading on the Frankfurt stock exchange. Investors are increasingly worried about the financial health of the bank, which now faces a $14bn fine in the US for mis-selling mortgage-backed bonds before the financial crisis of 2008. "The plight of Deutsche Bank could have far-reaching ramifications," said David Buik at stockbrokers Panmure Gordon. Speaking after a meeting in Berlin, the German Chancellor Angela Merkel said: "I only want to say that Deutsche Bank is a part of the German banking and financial sector." "And of course we hope that all companies, also if they face temporary problems, can develop in the right direction." 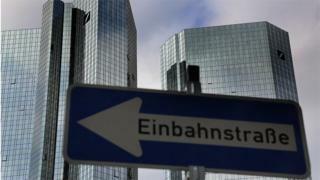 On Monday, the bank had denied suggestions that it had asked the German government for help in reducing the fine. "At no point has [chief executive] John Cryan asked Chancellor [Angela] Merkel to intervene in the RMBS [residential mortgage-backed securities] issue with the US Department of Justice," the bank said. "Deutsche Bank is determined to meet the challenges on its own." But what has continued to unnerve investors is the apparently well-sourced suggestion that the German government will not offer help, even if asked. The bank's shares have been falling steadily from a recent high of €27.80 last November. Panmure Gordon's Mr Buik said that if real problems did lurk at the bank, its shareholders would have to cough up: "Any rights issue will have to come from the private sector - there is little doubt that more capital is required. "For the sake of the stability of markets, DB needs to get on with it, in the hope that the contents of 'Pandora's Box' are containable," he added. Mr Buik pointed out that Deutsche Bank shares were worth €39 in January 2014 and €99.60 back in July 2007. Deutsche Bank: World's most dangerous bank?